Before I start, can I say that it feels like forever since I've done a proper blog entry? I've really had a tough go getting going this month. Let's call it the early-mid-winter slump and try to move on, shall we? Last year, I decided that the New Year's Resolution, while good in theory, doesn't really pan out well in real life - even for those of us who have in the past planned out parts of their lives 3 years in advance to a fairly high degree of success. Instead, I found last year that thinking of things on a monthly scale worked out better. make our apartment more "homey"
And I've done decently on both accounts. So far this month I've learned to make a quiche, chicken pot pies and given another go at making wheat bread in the bread machine (though I'm still in search of a great bread machine/wheat bread recipe, so if you have one, send it my way!). Last week Mr. Cleaver and I took a trek to Massachusetts in search of cheap Swedish furniture and while we came home with a few nice pieces, neither of them were what we were looking for (if you know of an affordable TV stand approximately 52"w x 30"h x 18" d or something to put a ten gallon fish tank on we'd be ever so grateful!) Even without said furniture, I did do some work on the living room - mainly hanging up pictures and sewing a pillow cover. 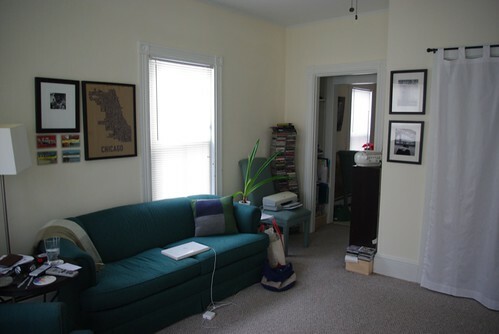 In any case, I'm finally going to show some photos of the apartment. A before and after, both in all their non-cleaned glory. 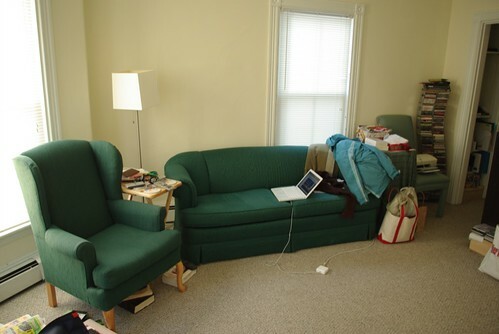 We bought the chair and couch separately (at a consignment shop and Goodwill respectively) but they match amazingly well. The borrowed tray table and fabric covered plastic boxes add a touch of class to the original arrangement as does the printer, just hanging out on a spare dining table chair from Craig's List. The Chicago neighborhood print was a Christmas gift I gave to Mr. Cleaver and is flanked by some vintage Maine postcards (one of which feature the Westbrook highway-seriously) and my first real art purchase, a Clifton Henri photo. The two photos by the closet are by my father and myself. The end tables are real tables now - but the printer is still hanging out, keeping it real. Not a real big change, but it does feel much better. 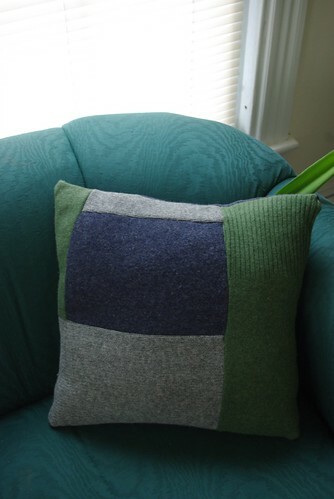 I whipped the pillow cover out of some leftovers of felted sweaters. 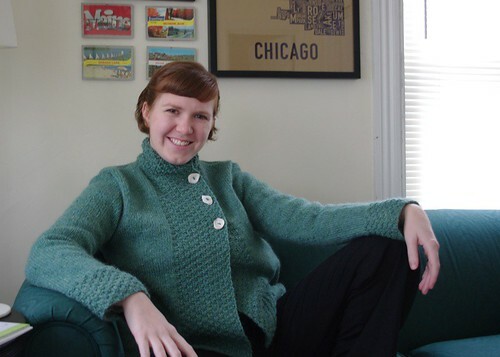 And if a certain reader from Oregon is wondering, hey aren't those my sweaters? And shouldn't I have some coasters/bowls coming my way? Yes they are and yes you do, they're just going through one more wash cycle before I mail them out next week - promise! 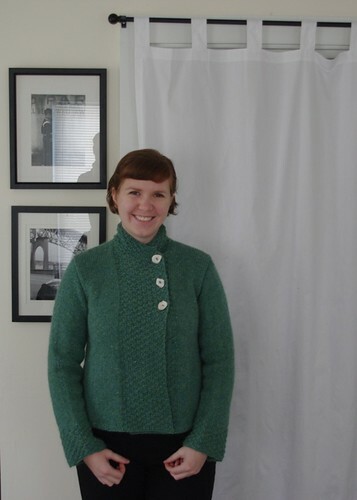 Speaking of sweaters and things completed on monthly scale, I'd also like to present to my "Mermaid Coat," so named for its sea moss colorway and oyster shell buttons. 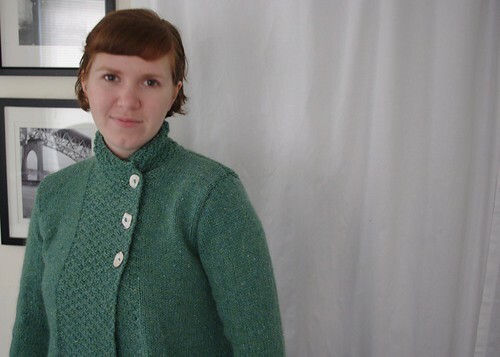 The pattern is the quite popular Drops A-Line Jacket, the yarn is Peace Fleece Worsted in Kamchatka Seamoss, and the shell buttons are from Savaged Relics. And like an actor in in their first high school play, I have no idea what I'm doing with my hands here. It is super cozy and super warm. It's a simple pattern and I finished the whole thing in month - give or take a day. So I guess you could day I'm sitting pretty on this whole "month-a-lution" thing. Now maybe for February I should decide to be a better blogger.